Week Eleven? Check! Can't believe I've kept up with this so far. This week I played with the Studio Calico March "Office Hours" kit exclusively. I love the colors and components of this kit so much! Once again I was drawn to black and white photos this week. It started with the photos of Tilly jammin' with her Daddy. They just begged to be converted to B&W. Then I just pulled a few pics off of instagram that were already converted to B&W. I love that I'm not tied to specific colors for the entire spread when I use a few B&W photos. I was pretty happy to have a few sunny days last week. My toes came out of hibernation and into Hasbeens for the first time in a long time. Ahhh!! Love the yellow and green in this kit. It worked perfectly with the picture I took on the seed aisle and just screams Spring to me! 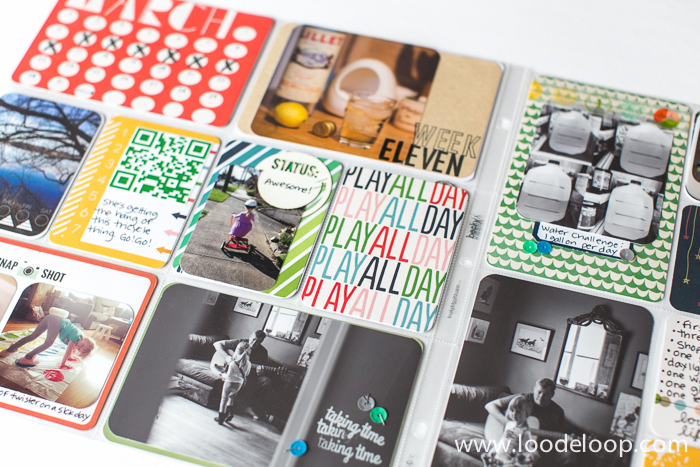 Want to link up your latest Project Life spreads?? Do so below! I'd love to see what you've been up to. Project Life | Week Nine at Disneyland!